Wrexham are hopeful on loan defender David Artell will receive international clearance in time for Saturday's home game against Alfreton Town. 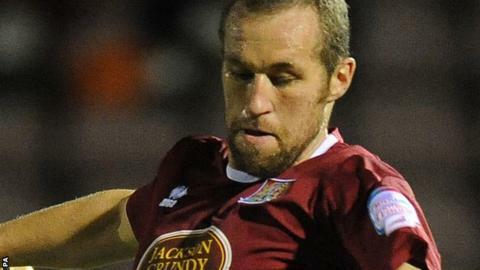 The 32-year-old has joined the Conference Premier leaders from Northampton on loan until the end of the season. "He'll come into the squad if his clearance [comes] through" said player-manager Andy Morrell. Artell has not played since October because of an Achilles injury. Despite his lack of games and with centre-half Martin Riley out with a hamstring injury, Morrell has not ruled out Artell starting should he eligible in time. "He hasn't played a game for a while but he's a good pro. He knows what to do, where to be on the pitch," Morrell added. Another midweek loan signing, striker Dele Adebola is available to make his debut after being granted international clearance. Wrexham will be without midfielder Jay Harris who has been handed a four-match suspension following his red card at Barrow. "We're going to miss Jay Harris for four games. It was a bit of a foolish thing to do with the state of the game," Morrell said. "It happens, you've got to deal with it [and] it's a chance for someone else to stake a claim. "Kev [Kevin Thornton] did great [and] scored a goal [against Barrow] so more than likely he will be involved as will Glen [Little]. "We'll pick a team that we think will go and beat Alfreton - another tough game."